The new Chiappa Rhino has revolutionized the revolver with a patented design that tames the prehistoric caracteristic that most revolvers possess. The new Chiappa Rhino barrel is aligned with the bottom most chamber which is the key component to Rhino’s tame characteristics. 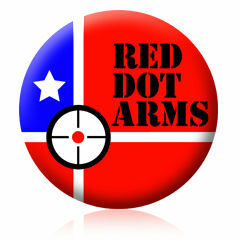 The position of the barrel lowers the center of gravity and yields a centerline of the bore more in line with the shooter’s arm allowing for the most natural “point ability” while engaging a target. This characteristic also drastically reduces both recoil and muzzle flip which insures subsequent shots to be on target faster than ever before. The reduction of the recoil allows for the use of ultra light alloys to be used in the construction of the Rhino minimizing any adverse effect. The flat sided cylinder design of the Rhino reduces the typical revolver profile allowing greater concealment. 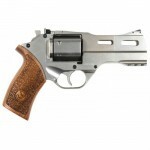 The Rhino is truly a multipurpose handgun capable of reliable defensive duty, scoring ten rings, and taking game. Featuring both double and single action characteristics, the single action is actuated by a hammer cocking device that engages the unexposed hammer to repare to fire.